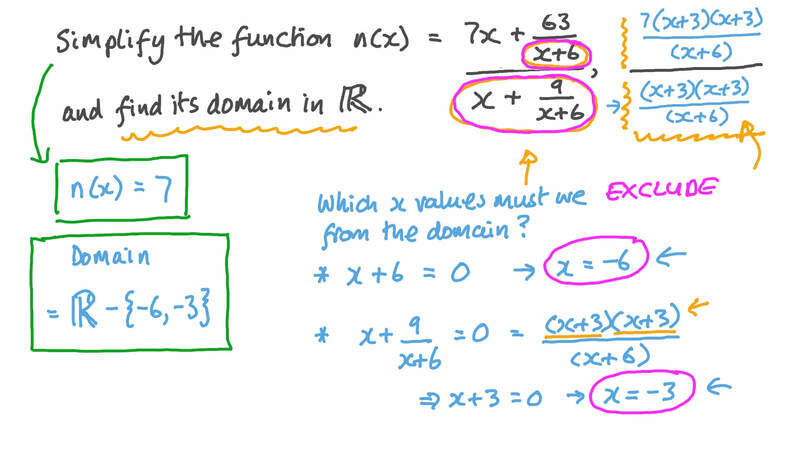 In this lesson, we will learn how to simplify algebraic fractional functions and determine their domain. Simplify the function 𝑛 ( 𝑥 ) = 7 𝑥 + 𝑥 + 6 3 𝑥 + 6 9 𝑥 + 6 , and find its domain in ℝ .
Simplify 3 + 1 −        completely. Simplify the function 𝑛 ( 𝑥 ) = 2 𝑥 + 3 𝑥 + 9 8 𝑥 + 1 4 1 4 7 𝑥 + 1 4 , and find its domain in ℝ .
Simplify the function 𝑛 ( 𝑥 ) = 6 𝑥 + 3 𝑥 + 1 5 0 𝑥 − 1 0 7 5 𝑥 − 1 0 , and find its domain in ℝ .
Simplify the function 𝑛 ( 𝑥 ) = 𝑥 + 4 𝑥 + 4 9 𝑥 − 1 4 1 9 6 𝑥 − 1 4 , and find its domain in ℝ .